The cow’s milk bags are so heavy, because they have so much milk, and why did they have so much milk, because they have so much desire to serve Krishna. Their milk in their bag is simply to the degree there is the expression of how much they want to give up themselves to Krishna, because every drop of milk there is being created consciously by them simply for the Krishna’s pleasure and for the pleasure for Krishna’s friends. The cow knows that Krishna doesn’t drink all the milk himself. Subala, Sridama, Balarama, Yashoda, Nanda, everyone drink milk in Vrindavan. They want to supply milk to everyone. They are the servant of servant. They know, if everyone is satisfied with their milk, then Krishna will be satisfied. Unless friends are satisfied, He will not be satisfied. Therefore, cows have big big milk bags because they want to give so much milk to everyone, but it is explained here, bigness of milk bag is big burden for them, They cannot walk so well but to them this is blissful. They are not concerned with how well they walk, their only concern is with how much milk they give to Krishna. This is the spiritual world. No one is concerned with their own existence. Bhaktivinod Thakur, he said the trouble that I undergo in the service that I offer to Krishna, are my greatest pleasure. Here we find an example of this, the cows of Brajbhumi, so much trouble carrying around this big big big milk bags, they can’t run very well, they can’t walk very well, they can’t sit and lay very well, but having those milk bags, its greatest pleasure to them, because it’s for Krishna. This is bhakti. A devotee is so grateful and so blissful to be in any situation, how he can better serve Krishna. – Radhanath Swami. 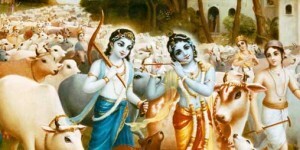 8 Responses to "Cow’s Love for Krishna in Vrindavan"
True. Everyone serves according to own inclinations and remain fully satisfied and blissful. True. Radhanath Swami shares the mood of the spiritual world. Everyone is simply concerned to give pleasure to Krishna and thus derive ultimate pleasure. Radhanath Swami explained beautifully through the mood of cows. Thanks Sumit for enlivening comment. Radhanath Swami Maharaj has so much affection for the cows. He used to wholeheartedly serve cows in New Vrindavan. The way he treated them was very inspiring. He would never hurt them in any way. He inculcated the same moon in Govardhan Eco Village too. Cows there are extremely happy with so much of freedom and loved by one and all. What a selfish Krishna. He was a sadist for sure. Cows are very dear to Krishna and that’s why He is called Govind. If one serves cows wholeheartedly, he can be graced by the love of Godhead. Thank you very much Radhanath Swami for sharing this secret. This lecture is a must hear. In spiritual world, everyone is a living entity and serves Krishna in a particular mood. Thank you very much Radhanath Swami for explaining Gopa’s love for Krishna. Radhanath Swami Maharaj reveals the true spiritual love that exists even in the cows of Spiritual world.